Next tasting in the Chocolove bar flight is the Milk Chocolate, and it is excellent. Just pure flavor; so smooth and rich, but not too sweet. 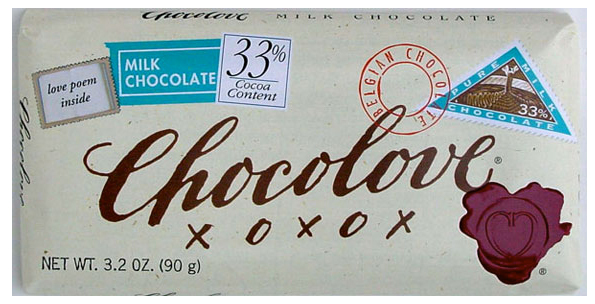 In fact, the back of the wrapper explains that it’s not too sweet because of the 33% cocoa content. It’s made in Belgium, and packaged in the U.S. And the packaging is beautiful with the inside wrapper containing a love poem. I’m glad for my sake that I bought the small version, because the full-sized version would have been gobbled down within the day. The small size version would be perfect in a gift bag, or care package. You will make anyone’s day better by giving them one of these. Or, better yet, just buy one for yourself. You can thank me later. Posted in Milk chocolate and tagged Belgian chocolate, cocoa content, milk chocolate. Bookmark the permalink.